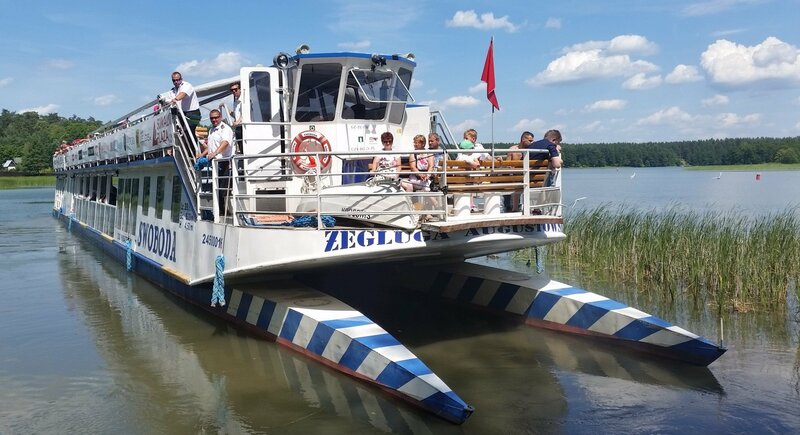 Boats that start the incredibly attractive cruise in the Rospuda Valley, leave the Augustów Port and go on the Netta River. It is worth mentioning that in the past, Napoleon’s Army chose the river banks for their overnight stay and rest during their Russia offensive in 1812. One of the soldiers who participated in the offensive was Ignacy Prądzyński – the future designer and builder of the Augustów Canal. He was fascinated with this charming place and when building the Augustów Canal, he designed the waterway to go through the town, despite the much shorter variants. At present, the beauty of Augustów is still appreciated, both by its inhabitants as well as tourists. Boats go past some of the most beautiful walking paths on both banks of the Netta River before entering Lake Necko. After covering a short distance on the lake, they turn in the direction of Lake Rospuda, located within pristine nature. The uniqueness of the Rospuda Valley, whose landscape is protected due to the rare species of plants and animals, became the reason to cease construction of the Augustów bypass in this area a few years ago. Boats turn around on Lake Rospuda and head towards the Augustów Port.